I think skiing is romantic. Not everyone does. And not all guys (sorry gentlemen, this is from a female perspective) get the romance angle of skiing, more prone to charging down the hill and back up the lift repeatedly. My gal pals tell me dudes can be brisk, “chilly” to their girlfriends, or downright “cold.” That’s not cool… show your loved one how warm and fuzzy this winter sport can be, for a win/win. Mind you, not all aspects of sliding downhill on snow are romantic (read: cold, steep, difficult). , falling or frostbite. Prevent the chill or shrill from setting in. Check the forecast and express concern that your snow date be bundled and dressed for skiing properly. Buy disposable hand and foot warmers -its downright heroic (and cheap at $2 a pair). For the commute to the slopes, have coffee, fresh pastries, ideally heated seats, make a chivalrous “pick up.” Make sure her ski boots are warm to start (it will be easier to buckle them for you later – lol). Carrying skis and buckling your date’s boots, while a thoughtful gesture, depends largely on the make up of your friend. My brother-in-law still buckles his wife’s ski boots after 20 years of marriage, so he obviously set that pampering precedent on a first ski date. Be aware, some women – myself -may not dig this level of gallantry . I like to be cared for, but I am not incapacitated. During those long chairlift rides, capture your quality time together. Here is your chance to snuggle close in the fresh air and discuss offbeat but revealing topics. Then you have your ski run to contemplate your next move. There is nothing corny about appreciating the scenery along the way either. Braving the elements together, and taking a fun silly #Selfie. As for the downhill portion of the date, be sure you ski terrain that is suitable for both of you. Reducing your ski partner to tears or humiliation is no way to her (or his) heart. Ego-pleasing terrain makes you both look and feel best. Only if you are both accomplished and eager to tackle the steep gnarly black diamonds should you point your boards to the expert runs to get your hearts pumping in tandem. As one Perfect Turn coach at Sugarloaf told me, “Boyfriends who take their girls down terrain they aren’t comfortable skiing should be shot.” That is a bit extreme, but I believe it underscores the point. Take breaks for a cocktail or hot chocolate (known for its aphrodisiac powers) or at least a beer. Make lunch at a sit down mountainside table for two, ideally not the clamoring cafeteria. Our favorite on mountain restaurants. Après ski is essential – think hot toddies and hot tubs. Both qualify as excellent post-mountain mood enhancers. Sitting by a roaring fire and recounting the day’s highlights is the perfect ending to your outdoor adventure. Slopeside lodging is prime location if you share a passion for first chair and first tracks. 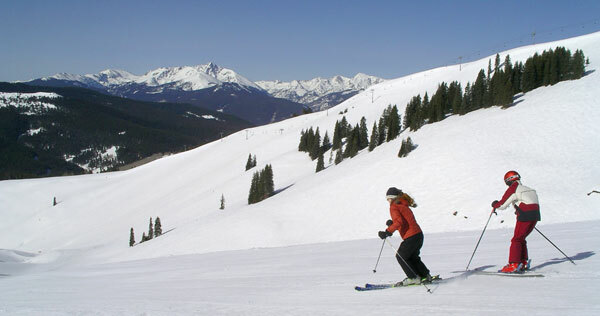 Look for lodging and lift ticket packages with massages for two, chocolates and flowers. If a more leisurely morning with gourmet breakfast is your preference, a ski town Inn or B&B is an inspired vertical venue. Skiing together is a positive way to get to know each other better, renew an extinguished flame, or even pop the question in a fantastic fashion. Haven’t you heard the saying “the couple that skis together, stays together”? Perhaps I have made it up – its workd for me and my guy for 30 years! Cheers.. Get out and share the love of skiing with the one you love… see our ski love story!